Early detection of water leaks has the potential to reduce costs associated with damage to pipes, surrounding surfaces and structures, as well as costly water bills. Depending on the site, we use two of the most reliable diagnostic tools for leak detection – Thermal Imaging and Acoustic Leak Detection. Non-invasive; Non-Destructive; Fast and efficient; Certainty; Saves time and money; Reduces potential hazards and damage to assets; Reduces downtime and disruption to project timelines. Thermal imaging is one of the most valuable best tools for diagnosing and detecting water leaks and locating hot water pipework in concrete slabs, walls, ceilings, bathrooms, and kitchens, etc. Our thermal imaging equipment allows us to measure and detect the changes in surface temperature that is being investigated. These temperature changes are not visible to the naked eye. By identifying surface temperature changes we can pinpoint leaks where there is no physical evidence of any water damage. Thermal imaging also allows us to track the extent of damage to the affected area, as often the leak is never at the point of the visible damage. Hiss or Whoosh sound – pipe vibration and orifice pressure reduction. Splashing or Bubbling brook sound – water flowing around the pipe. Beating/thumping sound – water spray hitting the wall of the soil cavity. Clinking sound – when water causes stones and pebbles to bounce off the pipe. The “Hiss” or “Whoosh” sound is the only sound which is always present for leaks in pipes with 30 psi or higher water pressure. Other sounds may or may not be present and are usually not as loud. Pipe material and diameter – Metal, copper and steel pipes transmit water leak sounds louder at a higher frequency than do PVC or cement pipes. The larger the pipe diameter the less sound transmitted and smaller frequency transmitted. Soil type and composition – Hard, compacted soil transmits water leak sounds better than sandy or very loose soils. Depth of pipe – Leaks in water pipes that are less than a metre deep are much easier to hear at the surface than leaks in deeper lines (which require larger leas with strong water pressure in order to be heard at the surface). Surface cover – Grass, loose soil, bitumen/asphalt, concrete slab – Hard street surfaces and concrete slabs resonate sounds of water leaks particularly well – a leak may be heard 2-3 metres either side of the water pipe. Grass and loose dirt surfaces make firm contact and acoustic resonation more difficult. Knowing what the pipe material and diameter is, is important for knowing how far the leak sound may be transmitted along the pipe walls. 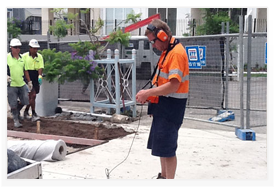 For Acoustic Leak Detection, locating the exact location of a water leak will usually be the spot where the leak sounds are the loudest. To find this spot, the pipe must first be located, and the technician will then move the ground microphone along the direction of the water pipe, listening for sounds and studying the visible display meter for transmission of the strongest sound, at which point a mark is made on the surface. For Thermal Imaging, infrared technology measures the changes in surface temperature that cannot be seen with the naked eye, meaning water leaks can be detected quickly and accurately.